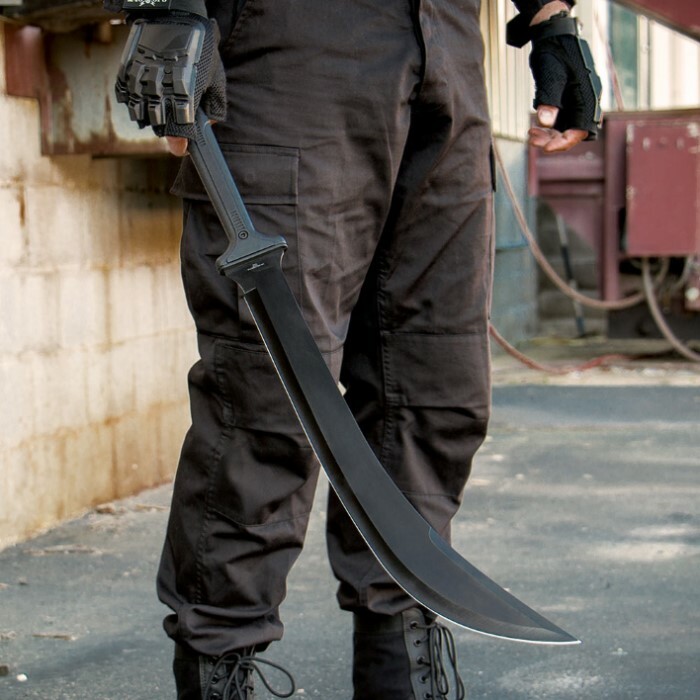 With the Combat Commander Thai Nagi Sword from United Cutlery in your hands, you will be absolutely combat ready! It features a 20" sharp blade is of 1065 carbon steel and has a black hard coating finish. The handle is of nylon fiber and is as tough as they get! A nylon sheath with a shoulder harness lets you carry it with ease. It is 40 1/2" inches overall. I'm a big fan of Eastern anti-cavalry cutting weapons such as the nagamaki, naginata, chang dao, miaodao, and especially the zhanmadao. 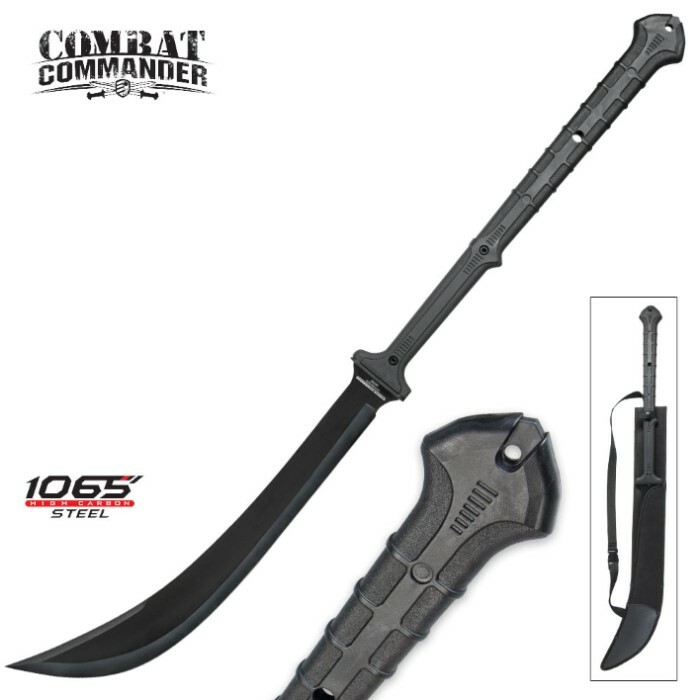 The "Combat Commander Thai Nagi Sword" , as it is called, is a fully functional modern equivalent to those archaic weapons. Even though I may never have to fight a mounted horseman, it's still a fun piece of steel to swing around in my backyard. Absolutely pleased & amazed! This is easily a 100-150$ weapon. Tough as nails, freakishly sharp, very durable haft with laynard hole. BudK: you have a winner big time! I have mine for about a year. It is very sharp out of the box as I learned the hard way. It is an interesting weapon / tool. 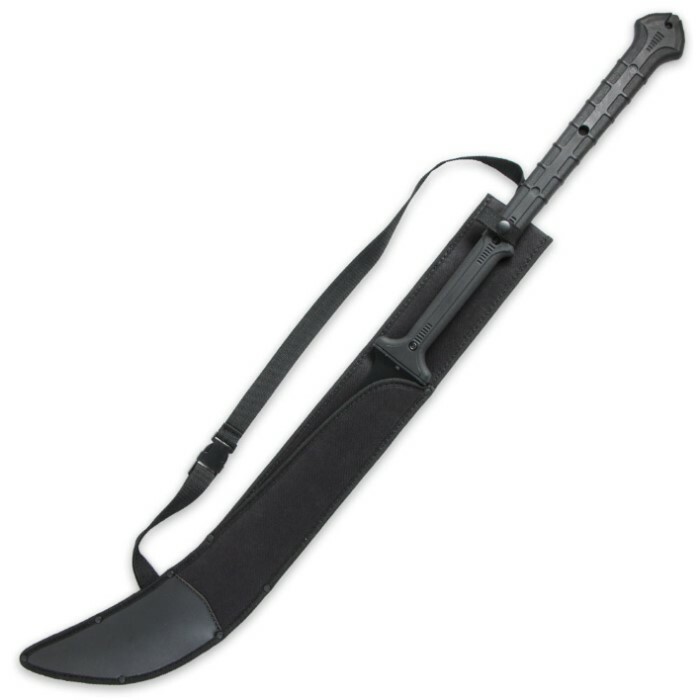 The scabbard is functional for the unique design. The handle is very good. The drawback is that the blade is very thin and mine was noticeably off center. This is more a hedge cutter then a weapon. It's a good buy, thought that I was going to get an email saying that the sword has been sent in 7-10 days, and then it would come. But instead it came in 7 days! (With today being the 7th day). Not that I'm not happy about that, it just shocked me that it came early. Now what I think of it: is that it is smaller than I thought but it is fine, not to big and not to small either. Now for the name bit part, that is my fault, at first I wanted the name to be "Lagoon" but since it's my character's name (I'm a writer and Lagoon Nebula is the person who uses this sword) I decided to change the name to "Charybdis" (mythology name if you are wondering). Now the reason why it didn't switch is because I was on the second step of ordering it so the name was kept. So I went back and changed the name to Charybdis and I was on the last step of ordering it when I remember to make sure that I have the street address right (which it was but I didn't know at the time). So it just switched back to Lagoon. Now instead of sending it back and having the name changed, you could just send me a video of taking of the name and putting Charybdis on, or instructions on how to do it because I am going to be moving into an apartment soon, so that is the reason for shipping it back and forth. But all in all, a good buy. And also giving a instructions on caring for a blade so that it will last longer is awesome too! Not many weapons websites do that (from what I know of, so nice job!). Feels Reasonably competent, My blade was very sharp! Only my pocket knives are sharper. BE CAREFUL!!! The point is excellent. The handle is Very good, maby needs a little cross hatching, you don't want this slipping out of your hands, it WILL hurt someone. I set mine on floor, handle DOWN, for several reasons. Do things CAREFULLY with this! This thai nagi sword is LEGIT! I already had the combat commander Gladius, and this is twice as awesome! The carbon steel slices through grass mats like butter and you should see what it did to watermelons!